The release date for his new documentary “Where to Invade Next” may have been pushed back from the end of December to February, but that’s not stopping Michael Moore from remaining in the headlines. Following up his letter last month that opposed Michigan’s Syrian refugee band, Moore has now posted a message on Facebook attacking Donald Trump for his anti-Muslim beliefs. 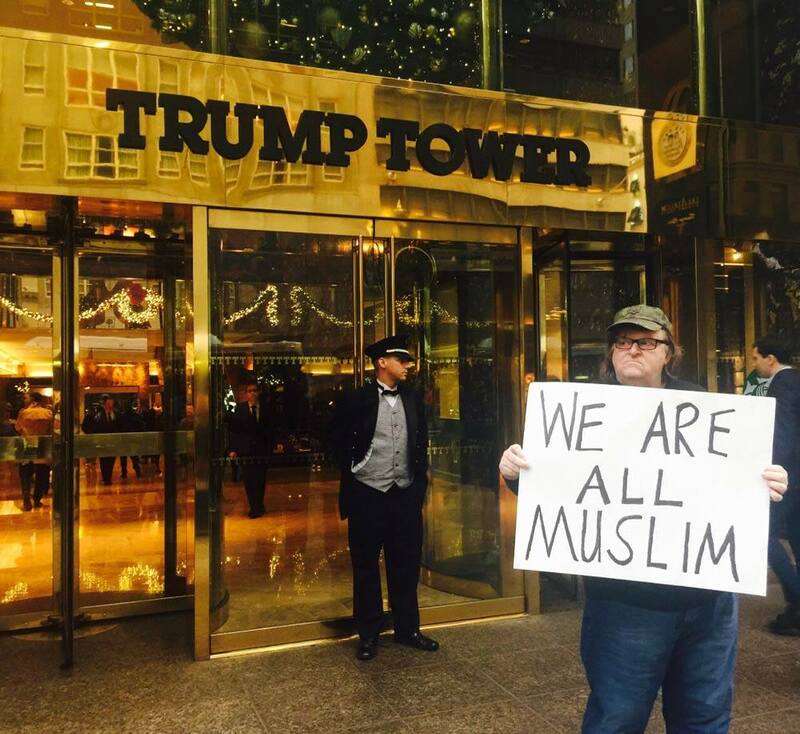 Moore went as far as standing outside of Trump Tower in New York City yesterday holding a “We Are All Muslim” sign in order to get his beliefs across. Check out the photo and read Moore’s entire statement below, courtesy of his Facebook page. ‘Does he think I’m going to tackle him and put him in a choke hold?’ I asked, bewildered. ‘Pick on’ you? I thought, where are we, in 3rd grade? I was struck by how you, a self-described tough guy from Queens, seemed like such a fraidey-cat. You and I went on to do the show. Nothing untoward happened between us. I didn’t pull on your hair, didn’t put gum on your seat. ‘What a wuss,’ was all I remember thinking as I left the set.